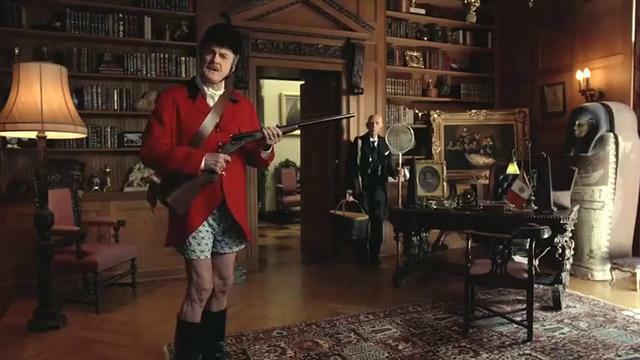 DirecTV is running a television advertising campaign featuring English comedian John Cleese. Cleese, known for his Monty Python work and character Basil Fawlty in Fawlty Towers, now appears as a new Lord of the Manor answering his own one-word questions. The Questions ad was developed at Grey New York by chief creative officer Tor Myhren, executive creative director Dan Kelleher, creative directors Doug Fallon and Steven Fogel, executive producer Andrew Chinich, associate producer Lindsay Myers. Filming was shot by director Tom Kuntz via MJZ Los Angeles, with director of photography Jo Willems and producer Suza Horvat. Editor was Gavin Cutler at MacKenzie Cutler, assistant editor Ryan Steele, and sound designer Sam Shaffer. Visual effects were produced at Method Studios, New York, by VFX supervisor Jay Hawkins, CG supervisor Doug Luka, lead Flame artist Jaime Scott, matte painter/compositor Amy Paskow, compositors Adam Schwartz and Alexander Koehl, CG animator Matt Hackett, CG lighter Jaemin Lee, FX artist Andreu Lucio, shoot supervisor Nordin Rahhali, executive producers Gabby Gourrier and Stephanie Gilgar, VFX producer Christa Cox and production coordinator Carlos Herrera. Colorist was Tom Poole at Company 3.